By now some of you may have seen articles about the revealing of several old Kodachrome slides in an auditorium in Mexico on May 4, 2015, which supposedly show the remains of an alien found in New Mexico at the Roswell flying saucer crash site in July of 1947. If you have seen those pictures and know about the event then you also understand that it must have been a great let down for many people in the UFO community who are longing to have tangible proof that extraterrestrial aliens are real; and proof that the Roswell crash was an authentic UFO event hastily covered up and shrouded in mystery by the United States military since that fateful afternoon in July 1947. I do not have permission to post the pictures of the alien slides here but I will provide you with these two links so that you may see for yourself. It is sad to hear that so many people were let down by this, and what is even more sad is that people were charged money to attend the event in person in Mexico, as well as those who paid for online access. It is particularly sad because so many people long to see real proof that aliens are real, and it also attest to the fact that so many people are willing to part with their hard-earned money for what they hope is solid proof to validate their belief. Unfortunately, they are grasping at straws with this one. As a researcher who has looked at the alien issue for a long time I understand their anticipation. I knew about this event and like so many other people I was waiting to see what the slides revealed before making any comment. I wasn’t disappointed though because I understand the nature of the UFO enigma, that is what this blog is all about. I feel like a lone ranger out here trying to shout the truth from the house-top, I just hope that my meager efforts are able to help someone escape from this kind of UFO and alien madness. I just knew that whatever proof surfaced it was going to turn out to be an “epic fail” as so many have labeled the event. And truly it was an epic fail. My question is, why did the hosts of the event lead so many people on for so long, knowing that the supposed smoking gun was nothing more than an old Kodachrome photo of a child mummy in a museum some place in the world? Or, that the two slides in question were of a model someone put together, perhaps to display in a carnival sideshow? Folks, the alien myth isn’t true, it is just that, a myth. We have been led on by lies, deceit, CIA cover stories for Black Ops, psychological experimentation, and a host of other nefarious reasons. But the real reason is that we have allowed our culture to dictate our belief systems so much, that many people will go on believing aliens are real in spite of the fact that proof is never found. And when some bit of evidence supposedly does surface it always seems to turn out to be a lie, and a great let down just like this event. 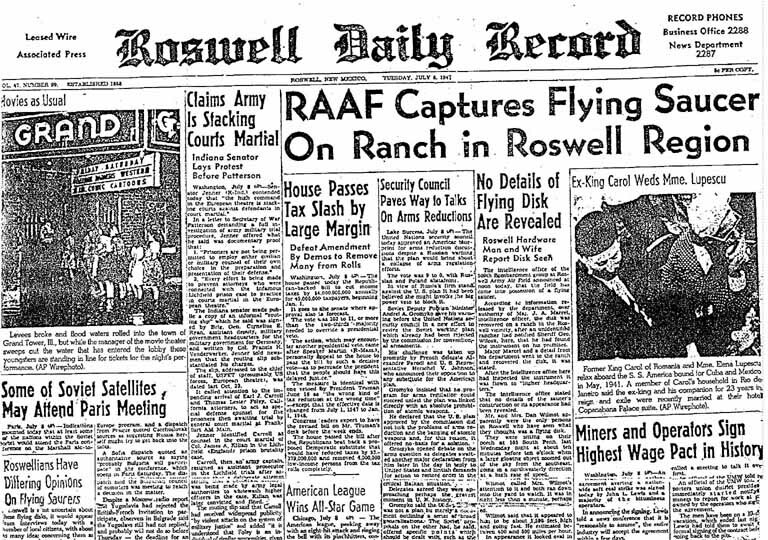 The possible answer (and more than likely the truth of the matter), of the Roswell crash of 1947 is this: After World War Two, the United States through Project Paper Clip imported a rather large group of Nazi scientists, bringing them to the States to take advantage of their scientific knowledge and highly developed German rocket technology. In fact, the U.S. was forced to do this rather than have these Nazi scientists fall into the hands of the Russians. On the other hand, Russia also took advantage of the situation and brought a great number of Nazi scientists to Russia as well. Two German aerospace engineers who were brothers, Walter and Reimar Horton developed an aircraft that did not have wings or a tail, it was a true flying disk. Two of these flying saucers flew across the Bering Straight into Alaskan airspace and down the western part of the United States eventually crashing in New Mexico; one of them was the flying saucer found by Mac Brazel on the Foster ranch 30 miles north of Roswell New Mexico. 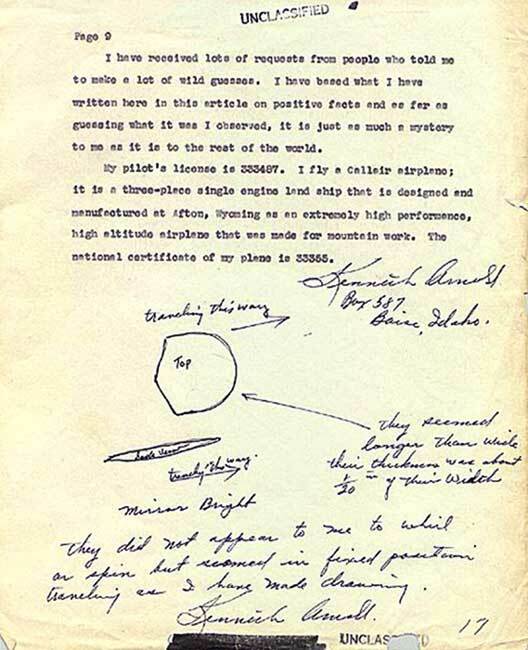 This kind of aircraft may have been what Kenneth Arnold spotted near Mount Rainer Washington on June 24, 1947 just days before the Roswell event, as the craft he described perfectly fit the description of the Horton flying disk. At first the it seems impossible that aircraft of this nature could have been developed in the 1940’s, but you may check out the facts for yourself in a very interesting book by Annie Jacobsen called, AREA 51, An Uncensored History of America’s Top Secret Military Base . For interesting details about the Horton brothers see pages 37-44 of Jacobsen’s book. It details insider information regarding the Horton brothers and their highly advanced flying disk. In fact, the Horton flying wing was more advanced than anything seen by U.S. Air Force engineers, and this surprised and worried Army intelligence at the time. It worried them much that they searched all over Europe in order to locate Walter and Reimar so that they could find out more information about their advanced aircraft technology. 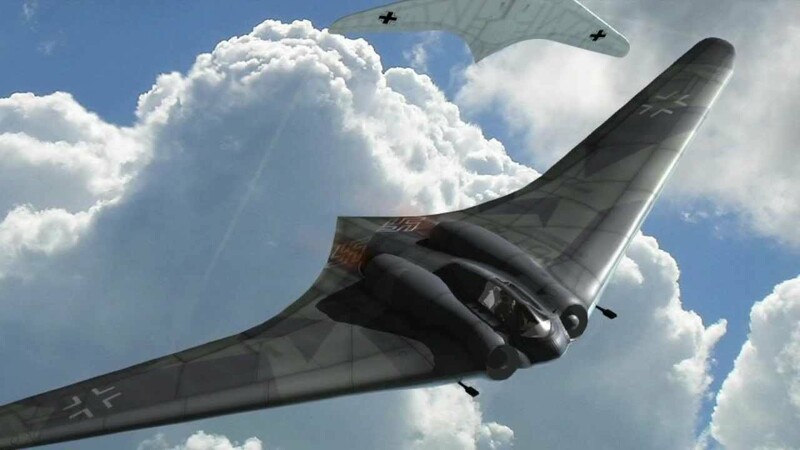 Truth be known, this aircraft was reverse engineered at Area 51 and the information gleaned from the Horton aircraft eventually led to the development of the high-flying U-2 spy plane and later on America’s stealth aircraft technology. As a side note, this technology and similar craft are probably what witnesses have seen hovering in and near Area 51 over the years. I suspect it is a very good chance that our military has an operational flying disk and they may have more than one. If that is the case it is more than likely a very advanced aircraft when compared to the original Horton concept. If they do have such an aircraft it may indeed operate like a flying saucer as imagined in science fiction; and this in turn may have led many UFO witnesses to believe that what they saw was a real extraterrestrial flying saucer; when unbeknownst to them it was an American military aircraft whose design was engineered from the original concept of the Horton flying wing. That’s really all that can be said about Roswell, or the Roswell slides. I am sorry that the whole event was a bust, and a very great letdown for so many people. It should serve as a reminder that extraterrestrial aliens really do not exist at all, and any proof should be held at arm’s length, examined carefully, and taken with a grain of salt. In the mean time we are still being conditioned by our culture, and fallen angels, to believe in extraterrestrial aliens. This should serve as evidence of one thing: we should examine our beliefs to see if we have fallen into the alien trap. We are facing a deep spiritual deception and we must be wise and very careful regarding UFO and alien phenomena. The dangerous part of all this is that when Bible prophecy does start to play out, and when the Dragon and his fallen cohorts are cast from the heavens to Earth, billions of people will believe they are aliens (Revelation 12:7-9). The important point to remember in all of this is that it will be very hard to deny the existence of extraterrestrials when they are standing right in front of you in the flesh, but in all reality it will be a tangible manifestation of evil, and the arrival of the Fallen Ones. But if you have spiritual wisdom, and are armed with biblical truth, you will not be counted among those who will fall for this great spiritual deception. Because of the mercy and grace of Almighty God the Holy Spirit currently restrains the power of sin and evil in both humans and fallen angels. But, the Apostle Paul warned us that once the Holy Spirit releases His restraining power all hell will break loose on Planet Earth (2 Thess.2:7-8). And when the end looks like it is near because of the overwhelming madness of human sin, the alien savior happens to show up! Oh, how clever the Fallen Ones are, and how simple humans can be, when in the presence of pure evil and because of spiritual blindness, humanity will be unable to see evil in its fullest manifestation, even when it is standing right in front of them in the flesh. Don’t fall for the alien lie, don’t allow the false prophets of the alien community to lead you astray like sheep to the slaughter. Seek after the wisdom and knowledge of God. For in Christ Jesus dwells the fullness of the Godhead bodily, and He is the Truth, in contrast to the alien lie and the lies of the alien false prophets. The alien myth is so entrenched that one of the readers who left a comment still blames the government for covering up the truth in the Roswell crash. Folks, it wasn’t an interplanetary craft that crashed at Roswell in 1947: it was either a Project Mogul high altitude balloon , or as I state in this article, it may have been a Horton flying wing aircraft as revealed by Annie Jacobsens book on Area 51. The alien myth will turn out to be a deep spiritual deception one day. If you are interested in the truth about UFOs and aliens and how they are intricately linked with the fulfillment of Bible prophecy then check out my book called Alien Antichrist, The Terrifying Truth about UFOs and Aliens, Antichrist, and the End of Days. In the book I present evidence that the final end-time ruler called the Antichrist is really a Fallen Angel who will be released from the abyss to conquer the Earth, subdue mankind, and attempt to prevent the return of Jesus Christ. This is not a book of fiction but biblical truth and Bible prophecy, and if you are interested the last days and how prophecy will play out then consider getting a copy of the book today. I promise you it is a deep study and you will not be disappointed. This is not UFO and alien fluff, and it is not like the fake UFO slides and all of that worthless hype, but this is truth, deep biblical truth so that you will be able to face the end of days with hope and faith. For the grace of God that bringeth salvation hath appeared to all men, Teaching us that, denying ungodliness and worldly lusts, we should live soberly, righteously, and godly, in this present world; Looking for that blessed hope, and the glorious appearing of the great God and our Saviour Jesus Christ; Who gave himself for us, that he might redeem us from all iniquity, and purify unto himself a peculiar people, zealous of good works (Titus 2: 11-14).